When: 2pm Saturday 8th February. What: Stop Killing Cyclists has invited London and Southwark Politicians, Transport for London (TfL) and the Press on a cycle-tour to show how the London Boroughs, TfL and The Mayor’s Office are frequently making London’s streets more dangerous for cyclists and pedestrians with new developments. The tour will include huge new regeneration projects at the Elephant & Castle and Camberwell, dangerous new junctions at Tower Bridge Road, Elephant and Southampton Way and a new housing development blocking permanently the Mayor’s Cycling Superhighway near the Oval. Whilst most of these planning disasters are being created by the London Boroughs, some are being funded by the Mayor’s Office, whilst others are along the TfL routes. There is an adjacent Boris Bike Stand if people wish to hire a bike for the tour. 1. 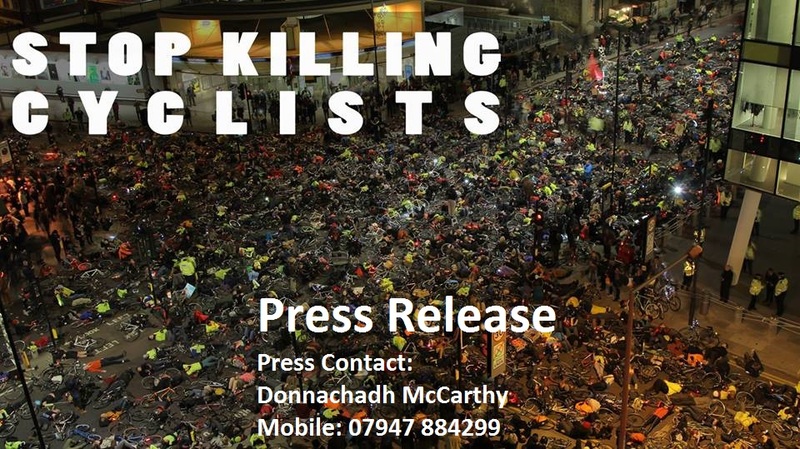 Stop Killing Cyclists is the direct action protest group set up after the recent spate of cyclist killings in London. They arranged the mass Die-In at TfL HQ where 1,500 cyclists lay down in the road in protest at lack of safety investment in London. 2. The London Boroughs are responsible for 95% of London’s roads, whereas the London Mayor and TfL control the remaining 5% i.e. the very large arterial routes. The proposal by Transport for London for Tower Bridge Road at Abbey Street. A formal objection from the Stop Killing Cyclists group to Transport for London’s proposals for Abbey Street / Tower Bridge Road junction have now been submitted. We wish to formally object to the proposals for Abbey Street Junction pedestrian cyclist safety. Whilst welcoming your intention to make the Abbey Street/Tower Mill Road junction safer, we believe the proposals made do not adequately address the safety of pedestrians and cyclists adequately. Whilst we welcome the left-hand ban for trucks at two corners as due to how Southwark Council designed the adjacent two new developments, these turns are too dangerous for cyclists and traffic to mix on. But banning cyclists from using 50% of the left-hand turns at the junction is not acceptable as there are no safety reasons for doing do. 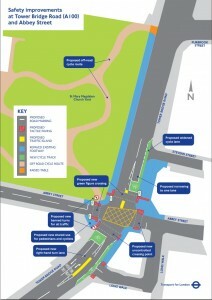 The reason given by TfL for the ban is not cyclist safety but to facilitate speed for traffic through the junction. 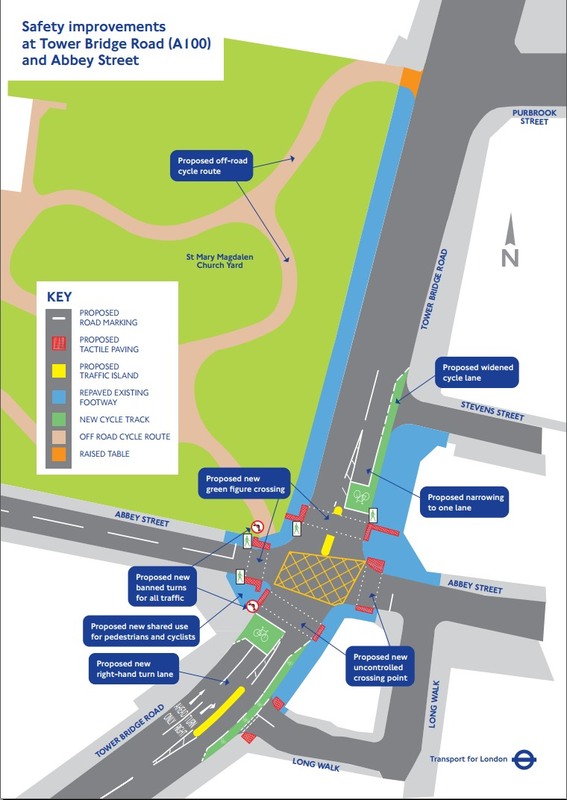 Indeed the proposal to re-route cyclists through the adjacent graveyard increases the danger as it creates a new unregulated traffic interchange as cyclists re-emerge from the graveyard to re-join the traffic on Tower Bridge Road. It also creates a new danger for pedestrian danger as the cyclists emerge unexpectedly from the graveyard to cross the pavement to re-join the traffic. Cyclists and pedestrians do not need such unnecessary conflict to be designed into these proposals. Your proposal fails Go Dutch standards abysmally and leaves this junction almost as dangerous as it was when the cycling tragedy occurred. TfL need to tear up this proposal and start from scratch with the Dutch standard layout for junctions, to address pedestrian and cyclists’ safety as the priority not speed of traffic. This approach makes junctions safer for both pedestrians and cyclists, without banning left hand turns. If the physical failure to design in safety by the two new building developments at the junction, means that this Dutch approach is not feasible, you should instead install dual function traffic light system, whereby the cyclists and pedestrians cross at the same time, rather than forcing cyclists to cross at same time as HGVs. Such dual function pedestrian/cycling lights are already in place at a small number of junctions in the borough. We strenuously also oppose Option 1 which prioritises traffic flow over pedestrian safety. It is not acceptable to have two sides of the junction to be uncontrolled for pedestrians. The dual lane approach which fails to provide protected access to the advance stop lines on Tower Bridge Road should be deleted and replaced with a single lane approach with protected cycle-lane access to the advanced stop-lines. Some local south-east London young people made this short film about that amazing moving evening when Stop Killing Cyclists cyclists staged our first powerful, moving protest in front of TfL’s HQ. It is hard to believe with all that has been happening since with the creation of Stop Killing Cyclists etc that it was less than two months ago since we organised it. Thanks to everybody who helped make it happen and pitched in with all the actions that have resulted from it since. Further information about the TfL die-in is HERE. Stop Killing Cyclists condemns the Mayor of London’s Announced Funding for Borough Cycling safety as an insult to those killed on London’s streets. But the money was neither additional nor was it £17.3 million. 1/ As the funding was from the already announced Transport for London (TfL) cycling budget this money is NOT additional. It means that the Mayor of London has failed to spend an extra penny on cycling since the recent tragedies or made a single extra junction safer. 2/ As the £17.3 million was a budget for three years, the actual spend this year will NOT be £17.3 million but will be £5.8 million. As there are 32 boroughs, this is the equivalent of an insulting £181,000 per borough per year. When you consider it costs up to £2 million to make a single major junction safe for pedestrians and cyclists, you realise that this is just cheap political Public Relations, at the expense of Londoners’ safety. Transport for London currently spends about 1.2% of its annual £6,800 million budget on cycling, despite the fact that cyclists now undertake 4.3% of all journeys. “It is a complete disgrace that over 10,000 London pedestrians and cyclists have had their lives destroyed by being either killed or seriously injured since 2008. During the same period only 3 people were killed on the entire national rail network. London’s roads are not fit for purpose“. 2. The press release from Transport for London was issued on 23 January 2014 and is available online HERE. Representatives of the 1,500 cyclists and pedestrians who staged the Mass Die-In at Transport for London’s HQ following the recent spate of 6 cyclist deaths met yesterday with Leon Daniels and Andrew Gilligan. The attached letter contains the items that the Stop Killing Cyclists Deputation agreed at yesterday’s meeting with TfL. * Andrew Gilligan agreed to ask the Mayor about introducing cycling/pedestrian representation on the TfL Board. * Leon Daniels agreed to include cycling in the Crossrail Report being commissioned into the future of Oxford Street including its pedestrianisation. * Andrew Gilligan agreed to consider annual survey of the London Borough’s Performance on Cycling. * Andrew Gilligan agreed to consider process on how to ensure Superhighway routes are not blocked by Borough Planning decisions. * Andrew Gilligan agreed to consider how TfL could provide expertise/Training to the Boroughs on Go Dutch standards of cycling infrastructure provision. * Leon Daniels and Andrew Gilligan agreed a follow up meeting with Stop Killing Cyclists in March. “There are some large boulders to be removed from the route to get the safe cycling/walking London that Stop Killing Cyclists wants urgently for London’s children, pensioners and the vulnerable. 1. 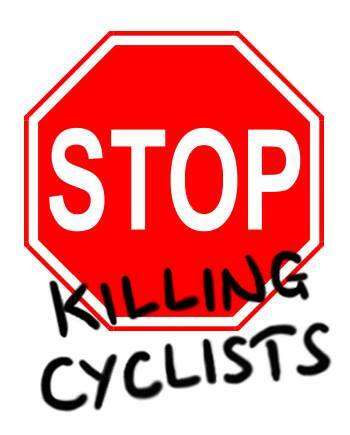 Stop Killing Cyclists was founded by grassroots activists following the awful spate of cycling deaths in November 2013. 2. List of Demands presented to Transport for London and Cycling Commissioner is in the briefing paper: click HERE. 3. Follow up letter from Stop Killing Cyclists to TfL: click HERE. Thank you for the time you spent with us for yesterday’s discussion – it was much appreciated. We collectively thought it was a forthright and constructive exchange. Andrew agreed to consider the potential for an annual survey of cycling provision in each of London’s 32 Boroughs. This would facilitate an objective comparison of cycling provision in each Borough and provide a useful information course for safety campaigners in the individual boroughs. Stop Killing Cyclists undertake to consult with our 1,600 members and submit some suggested criteria in time for the next meeting. Leon agreed to include provision for cycling in the terms of reference for the study being conducted to consider changes in that street’s layout and function as a result of Crossrail’s opening in 2018. TfL to ensure that any terms of reference for this consultant will consult with cycling and pedestrian groups as part of this study, to ensure that its consultations on the option of closing Oxford Street to vehicular traffic includes the potential for making Oxford Street a pedestrian/cycling major hub. We would welcome if TfL could seek to provide a categoric response over which agency – it or Westminster Council- serves as the primary legal highway authority for Oxford Street, taking into account the powers vested in the Transport Management Act 2004 which gave TfL powers (a) to stop the Westminster City Council from exercising powers in the Road Traffic Regulation Act 1984 and the Highways Act 1980 and (b) the Secretary of State for Transport powers to designate a network of Strategic Roads in London which he exercised and included Haymarket, Oxford Street, Piccadilly, Regent Street and Strand. Andrew agreed that a mechanism was needed to ensure any planning applications (in addition to the major projects that are already referred to the Mayor’s Office) that are submitted along the routes of the Cycle Superhighway, do not negatively impact on current or future designated superhighways. Ideally any planning applications along the routes would need to be referred automatically by the Boroughs to the Mayor to comment on whether they provided adequate space for the superhighways. Stop Killing Cyclists agreed to submit such a proposal to the consultation on the new London Plan. But we would also welcome the Cycling Commissioner considering if any action can be urgently undertaken in the meantime to ensure more disastrous decisions are not taken by the boroughs along the Superhighway routes. Stop Killing Cyclists raised the important issue of how junctions along the routes of the superhighways are dealt with. We believe there appears to be very little thought currently given to the safe entry and exits from the blue lanes. We would welcome a response to how this can be remedied urgently for the already installed and planned Superhighways at the follow-up meeting. Andrew referred to the surveys carried out into Londoners attitudes to cycling. SKC seeks to represent the interests also of the large percentage of Londoners who wish to cycle but are currently too frightened to do so. We would welcome future surveys to ask how many people would like to cycle regularly if a safe cycle lane network was installed and other such questions asking what would be the key actions that would encourage them to cycle regularly or allow their children to cycle. SKC suggested that the Boroughs be offered pro-actively by TfL, training schemes for their traffic engineers/planners/lead councillors in Go Dutch Standards and philosophy which puts the expected actions of a range of road-users (from good to bad) at the heart of the design process. We would welcome a response to this suggestion at the next meeting. We will send a separate invite to our Cycle Planning Disasters Tour on the 8th February. Both AG and LD agreed to a follow up meeting to discuss the Stop Killing Cyclists Demands that were not covered at the meeting. We are grateful for your willingness to have a results-focussed dialogue with Stop Killing Cyclists. Please liaise with Donnachadh to agree a date. We look forward to our next meeting within two months. In its first major campaign success, the Stop Killing Cyclists group welcomed the re-issuing of Ministerial Guidance on Pavement Cycling by the Minister for Cycling Robert Goodwill MP, in response to representations made by the campaign to the Minister for Transport. Will the police see sense over cycling on pavements?